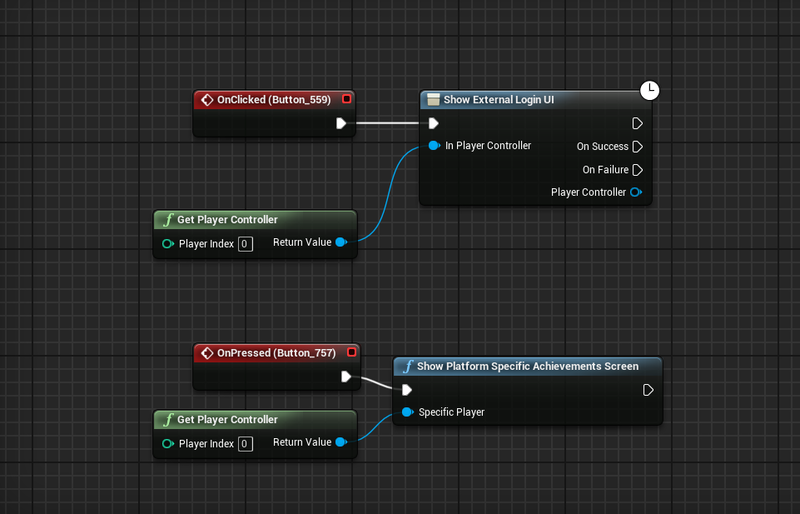 I am using UE 4.10.4 and Android 5.0. After viewing several tutorials on how to implement these 2 Google Play services, I believe I have it set up right. I am able to log into Google Play using the Show External Login node, but when I hit the button to display the achievement progress, simply nothing happens. The top button logs in and works just fine, but once I'm logged in, hitting the button that triggers the bottom nodes has no effect. I'm 99% sure it's correct as it all came from the Google Play Developer Console. I have also attempted to do the same with Leaderboards, but have the same outcome. Choosing to show the leaderboards instead of achievements still has no effect at all. This is the last feature for my game so I'm really trying to get this working so I can push to production, let me know if you guys need any more info! And thank you for any help! EDIT: I realize that I did not cache the achievement progress, I have just added this to occur after a succesful login from external UI and the cache achievements fails. I solved this myself, I had not published the Google Play Services portion of our developer account. Apparently you publish the game and the services separately. All is working now. How get info about player from google play service and ios gamecenter? In-app purchase "authentication required error"
How to reset google play achievement in blueprint?